Let's talk about your organic reach on Facebook. Why has it been going down and why is it about to get worse? If you promote your business on Facebook at all, watch the following video, listen to the audio, or read the transcript below. Why is Facebook clamping down on content from brands? Should you pay more to get more exposure and engagement on Facebook? What is the mindset shift that we all need to make as we're marketing our businesses on Facebook? What does Facebook want from us anyway? This is nothing new. It's been happening for years. When this first started happening, a lot of businesses that have Facebook pages fan pages started noticing that their organic reach was going down. They would publish posts but very few of their followers would actually see those posts unless they paid to boost or advertise their content. And business owners and marketers got annoyed with this. Some people were mad at Facebook because they worked so hard to build this audience and now Facebook wasn't letting their audience see their content. I have a theory about why Facebook is doing this, which I will explain later. The first thing to remember is this is not new. This has been happening for years. Secondly, all Facebook pages are affected. It's not just the small businesses pages with only a few hundred or a few thousand followers but even large pages are affected. that the number of Facebook page fans has been increasing and yet their reach has been decreasing. More people are following their page but fewer people are actually seeing the content they're publishing on their page. Why do I say this will get worse? ?This is the reason why I say the organic reach of Facebook pages is going to get even worse. One of our big focus areas for 2018 is making sure the time we all spend on Facebook is time well spent.... We built Facebook to help people stay connected and bring us closer together with the people that matter to us.... But recently we've gotten feedback from our community that public content -- posts from businesses, brands and media -- is crowding out the personal moments that lead us to connect more with each other.... The first changes you'll see will be in News Feed, where you can expect to see more from your friends, family and groups. 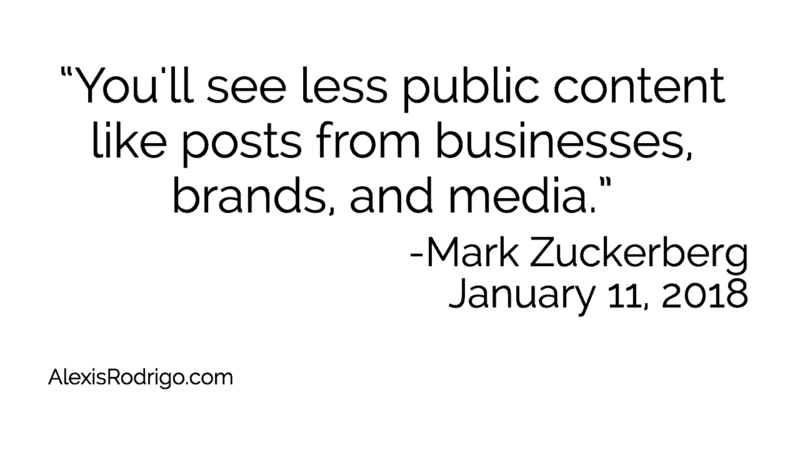 As we roll this out, you'll see less public content like posts from businesses, brands, and media. Zuckerberg says they're doing this because they're looking out for the well-being of the users. And so they want Facebook to continue to be a platform for personal connections and social interactions to take place--not just for people to passively consume content. My theory is they're doing this because Facebook doesn't want its users to leave. If you and I and other business owners and marketers are crowding the news feeds with ads, even you are not going to enjoy that experience. If everything you see on Facebook are pitches and ads then we won't enjoy the experience anymore and we will leave the platform. has 2 billion active users. because if there were to be a mass migration of people away from Facebook, then we would lose our opportunity to reach these massive audiences. Facebook changed its algorithm to keep users from leaving the platform. This is ultimately in the best interest of brands as well. What would happen then? Facebook would become a ghost town. It would become the Myspace of this day and age. Then we would have to follow people again to whichever platform they've moved to, and we would have to start over with our efforts to build our audiences and connect with them and so on. If you think of it this way, then these changes in Facebook's algorithm are actually good, not only for the users, but also for businesses and brands that are promoting their products and services on Facebook. Given the situation where Facebook is now going to show less and less of the content we're publishing as businesses and brands, what can we do? We're all in business and business is all about being resourceful and being flexible, being able to adjust to whatever changes come in the environment. Changes will always happen, so it's not useful for us to whine or complain about them. Instead, we need to change our mindset in terms of how we promote our businesses on Facebook. In the same statement, Zuckerberg said, "...the public content you see more will be held to the same standard -- it should encourage meaningful interactions between people." This now needs to be the standard we have for ourselves when we're publishing content on Facebook. This means we can't just push and push content on people. The kind of content we post should stimulate those meaningful interactions because that's what Facebook is looking. That's what Facebook wants. between people or between people and my brand and also between and among users? I have a few ideas about how we can do that, which I'll cover later. I'm not just talking about paying in terms of money. You know as a business owner and marketer that you're always paying anyway. You pay either in the form of time or money. We've gotten spoiled because of the internet and social media platforms. And we've gotten brainwashed or probably misinformed by a lot of internet marketing gurus who promise that online marketing is the way to promote your business that's free or almost free. While it's true that there are a lot of free tools out there, this is a business and there is a cost of doing business. Again, this is not a reason for us to complain. Absolutely, if you have the budget for it then you can test and experiment with Facebook advertising. It's still the one of the cheapest forms of advertising you can find anywhere. For example I tested advertising a video recording of mine and I ended up paying 0.8 cents--not 8 cents but 0.8 cents--that's less than one cent per view of my video. I don't know where else you can find advertising rates like that. And not only are they inexpensive but you can be super targeted as well. You can target specific age groups, people of a specific gender, people with very specific interests, people who come from certain geographical areas. So if you're even if you had the budget, for example, to have a TV spot airing during the Super Bowl, this is still a better deal because in the Super Bowl, you get exposure to millions but that's everybody. How many of that mass audience actually belong to your ideal market? They're probably not a large percentage depending on what product you have. But on Facebook, if you were to pay for advertising, you can be ultra-targeted which means you're likely to get better results. So what if you have to "pay to play" on Facebook? It's the cost of doing business. You have to pay either in time or in money - or both. Or you can pay in the form of time. I can pay through my time by manually interacting with or messaging people. For example everybody who commented on this video with the word "checklist" I can manually message and send the link to that checklist. Another example of paying with time is if you were to create a Facebook group and you grow your membership organically by approaching people, telling everyone you know about it. When you're in live events and then you promote your group and so on right. Or, you can pay with money and advertise your group on Facebook and have Facebook promote your group to other users and grow that way. It's one or the other or even both. And if you say "I don't have time and I don't have money," then you need to be doing something else! You can't run a business without one or the other or both. The question is, what are you willing to invest more of? Are you willing to invest more in time or are you willing to invest more in money? Or are you willing to invest invest both to reach this massive audience on Facebook and get your slice of this gigantic pie? 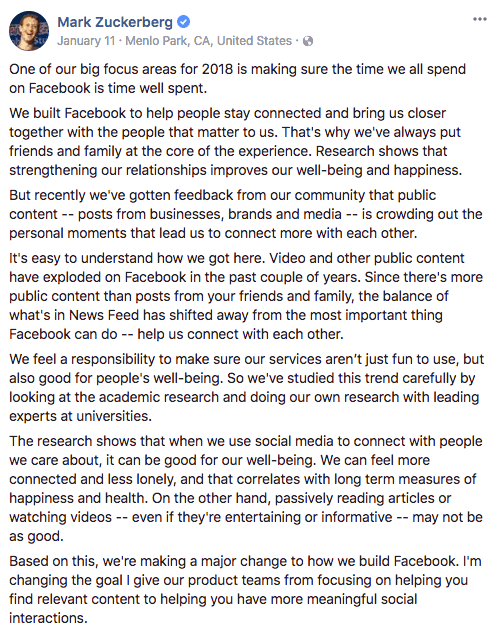 If we go back to the statement of Mark Zuckerberg, he says, "The first changes you'll see will be in News Feed, where you can expect to see more from your friends, family and groups." Facebook is actually promoting groups and giving a lot of support to community managers, precisely because they want to create more interactions. 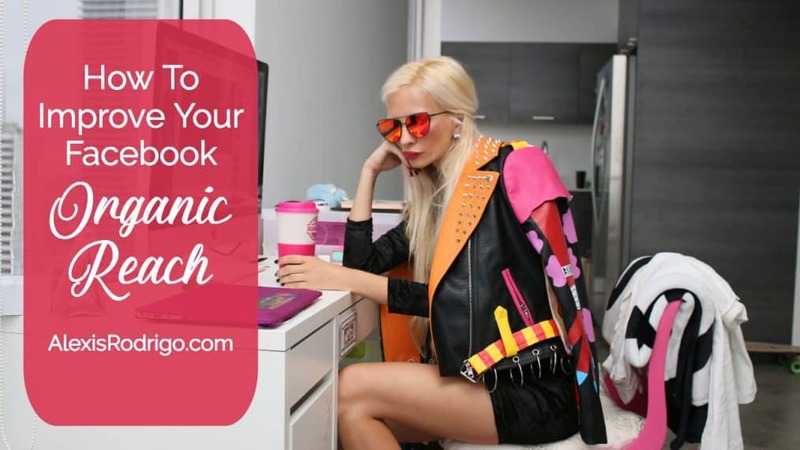 Have you created your own Facebook group? Facebook is supporting groups because groups are communities that form around a common interest. You can create a group from your Facebook page or as your Facebook page and be admin to that group. And you can post in your group your own group as your page, so that's one way to increase your organic reach. Facebook is displaying more content from groups, not just in newsfeeds, but also in notifications. You'll also see if you have a group that the content you publish in your group will get more exposure because Zuckerberg himself said they will be displaying more content from groups on people's newsfeeds. I see this myself. I see notifications when group admins post something new in the group or when other group members post something or comment on something in the group. This is not just my newsfeed that I'm talking about but the notifications part of Facebook which is very attention-getting, you have to admit. Aside from creating your own Facebook group or groups, you can and absolutely should be joining other Facebook groups, both because of your personal interests and for business reasons. Join groups where your target market is. I don't know if you've noticed but Facebook Messenger is actually separate from Facebook the social media platform. By this, I mean for example on your phone, there is a Facebook app and there's also a Facebook Messenger app. At one point, I had to install the Messenger app separately. I read that some people have the Facebook Messenger app but not the Facebook app. They're using Facebook Messenger but they're not using Facebook itself. Interacting with somebody on Messenger is the most intimate social interaction you can have with somebody on Facebook. This is the best interaction Facebook is looking for. When it comes to social interaction on Facebook, you can't get more intimate than interacting on Messenger. Am I talking about chatbots? Not necessarily. You can do a lot of things without automating the interaction through chatbots, especially if you do have a lot of time that you're willing to invest. If you can spend one hour or two hours every day just reaching out to people through Messenger, then you could see results. You absolutely can and, where appropriate, should be reaching out to people one-on-one on Facebook Messenger. The point of the chat bot is not to completely automate your relationship but to facilitate the things that can easily be done. For example, I said, "I have this free report. If you want it, type report in the comments." manually. Then I can use a chat bot to do it, which means you will receive the report you want more quickly. Do you see the difference where the chat bot is facilitating the relationship? Instead of me using the chat bot because I don't want to talk to my people? I'm probably starting to sound like a broken record because I think every Wednesday, when I go live, I say this: Go Live. Use Facebook Live. I keep telling even the people I work with and my clients to go live on Facebook. Because it is the fastest and easiest way to use video, which we know is more engaging and more interesting to people. More people consume video than plain text and images. And because it's live, you don't have to write a script and then, afterwards, you don't have to do any editing. This is why live video is really fast, although not necessarily easy, depending on how much experience you have with being in front of the camera. But you can always learn, right? Another reason is, again, because of Zuckerberg's post. He said, "We've seen people interact way more around live videos than regular ones." The regular ones that he's referring to are pre-recorded videos you upload or link to on Facebook. And Facebook is seeing that people like to interact when when the video is happening live. ?Go live on Facebook, because people interact more with live video and because Facebook gives live videos more exposure - sometimes as long as 9 hours after it occurred! I don't know if you've noticed but Facebook also pushes live videos to users. For example, I see it on my notification when somebody is live. Facebook shows it in my notifications for as long as that person is live. More than that, it's in my notification even hours after the person was live. The longest I've seen a live video in my notification is 9 hours after it happened! I prefer to use my laptop, an external webcam, and Blue Yeti mic, but all that is not necessary. If you want to get started with Facebook live, all you need is your smartphone. By the way, if you do want to get started with Facebook live, or you're already doing Facebook live and you want to make sure that you're better prepared, that the quality of your live videos are good, and that you get better results from your Facebook live streams, I have a checklist for you that's free. Click here to download it. Facebook is clamping down on content from brands because Facebook wants to keep its users happy and not inundated with ads, This is why our organic reach is going down. Facebook is doing this to keep users happy so that they don't leave Facebook. This is why this is actually good for you and me, ultimately. Stop whining and change your mindset from pushing content to encouraging interactions between people. Accept the fact that we all need to pay to play and we pay either in the form of time or money or both. Use Facebook groups. Create your own group or groups. Don't just join but interact. Use Facebook Messenger to engage in the ultimate social interaction you can do on Facebook, which is chatting one-on-one with another user or other users. When the volume of these interactions warrants it then absolutely explore chat bots. Do you agree with my understanding and my analysis of what Facebook wants from us and how we can improve our organic reach on Facebook? Reminder: Click here if you want the Facebook Live Checklist.